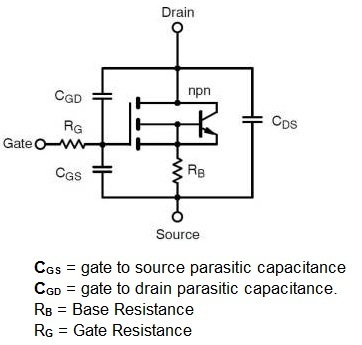 The turn ON and OFF times of MOSFET gets affected by its internal capacitance and the internal impedance of the gate drive circuit but it does not effect during steady-state operation. The gate voltage is made positive to turn ON the MOSFET. When the gate voltage has applied the gate to source capacitance CGS starts charging. When the voltage reached through CGS certain voltage level is called the Threshold voltage ( VGST ) at the same time drain current ID begins to increase. The time needed to charge CGS to the threshold voltage level is known as a turn-on delay time. 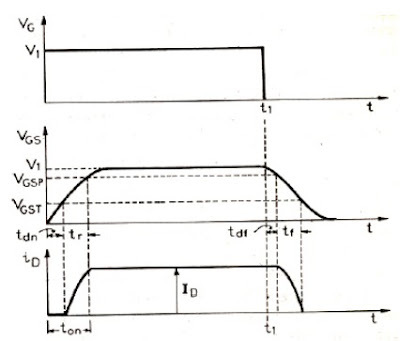 The CGS charges from threshold to the full gate (VGSP) voltage. The time required for this charging is known as rising time (tr). During this period, the drain current increases to its full value of ID because of that the MOSFET is fully turned ON. The turn-on time can be reduced using a low-impedance gate drive source. The MOSFET can be turned off with a negative or zero gate voltage. Due to this, the gate to source voltage decreases from VI to VGSP. CGS discharges from VI to VGSP gate voltage. The time required for this discharge is called a turn-off delay time, during which the drain current also begins to decrease. The CGS continues to discharging and its voltage equals a threshold voltage (VGST). The time required to discharge CGS from VGSP to VGST is called fall time (tf). The drain current will be zero when the voltage VGS < VGST then it is said to have turned off.